This recipe for Sous Vide Infused Tequila is from my brand new book, Everyday Sous Vide: It’s All French to Me. Snag the book for lots of amazing sous vide recipes like this one! This sous vide infused tequila is your new go-to summer booze. It makes DIY margaritas way more fun, and it’s just as good with my Husband and I’s favorite mixer: Diet Squirt (do NOT pass judgement until you’ve imbibed). The classic pairing of cucumber and lime is all kinds of refreshing in this sous vide infused tequila, and doing the infusion once means you don’t have to pull out a long list of ingredients every time you want a fun cocktail. Get immersion circulator setup and start preheating water bath to 155 degrees F.
Add all ingredients to a pint-sized jar. floating, your lid is on too tight. Cook for at least 1 hour, up to 3 hours. Remove from water bath and place on a towel and let cool for 30 minutes. Strain the liquid. Pour the liquid back into the jar and place in the fridge to store. But if you’re looking for an untraditional but refreshing cocktail… say no more. I gotchu. Oh, and since you’ve infused the tequila, you only need one other ingredient. My favorite kind of cocktail! We’re talking a Cucumber Lime Moscow Mule. Most importantly, you need one of these gorgeous copper mugs from Moscow Muled. Seriously, these things are legit. They do something a lot of other manufacturers don’t: they line their copper mugs with nickel. That’s because copper is a heavy metal that reacts with acidic fluids, such as cocktail ingredients. 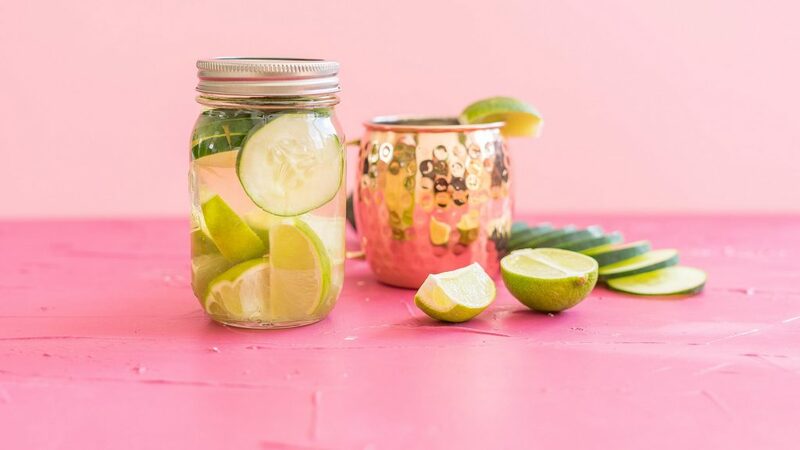 If you use a copper mug that is not lined with nickel, the acidic fluids in your drink will cause a chemical reaction which may cause you to ingest too much copper, leading to an unhealthy and potentially dangerous concentration of copper in your body. So get yourself a mug, then make this drink! Simply pour 2 oz of your infused tequila into a mug, top with ginger beer, and garnish with a lime. Seriously, that’s it. Enjoy! This is your moment to giggle. Read the title. Say it out loud. Now get aaaaallllll the giggles out. We good? Good! Because this method with a very silly name is AWESOME for getting an evenly cooked chicken out of your oven. Have you ever roasted a chicken, then cut into it only to find that it’s still raw in the center? Ugh. When you spatchcock chicken, you are much less likely to encounter this disappointing moment. To spatchcock a chicken, you simply remove the backbone. This allows you to lie it flat, spreading it out and allowing it to cook more evenly. If you watch enough baking competition shows, you know by now that when you overfill a cake pan, that cake will take forever to cook. Same concept here. If it’s not stacked as high, it’s gonna cook faster. When I roast a chicken, I season it simply. I mix butter with a favorite dried herb blend and salt, then rub it into every nook and cranny. It comes out full of flavor, moist, and oh so delicious. For a healthy side, try pairing this chicken with my 5 Ingredient Mashed Cauliflower. You’ll think you’re eating mashed potatoes – really. In a small bowl, mix together softened butter, herb blend, and salt. Set aside. 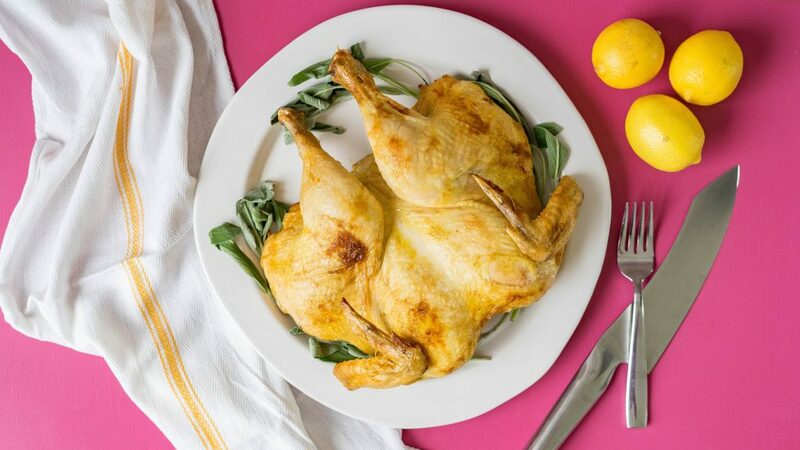 Place chicken on a cutting board, legs down and wings up. Use a sharp pairing knife and kitchen shears to remove the back bone. Flip chicken over and press it flat. Thoroughly pat it dry with paper towels. Using your hands, rub the butter mixture all over the chicken, including under the skin as much as you can. Line a baking sheet with foil. Place a cooling rack on the sheet. Place the chicken on the rack. Bake for 40-50 minutes, until internal temperature reads 165 degrees F in thickest part of the thigh and skin is golden brown. This recipe was inspired by a Warm Brussels Sprouts Caesar Salad I had at one of my favorite breweries in Portland, Ex Novo. They are AWESOME. First of all, all of their profits go to non-profits. Second of all, their beer is legit. And third of all, they manage to serve amazing, out of this world pub food. On their happy hour menu, you will find fried chicken sliders made with doughnuts. Yeah. 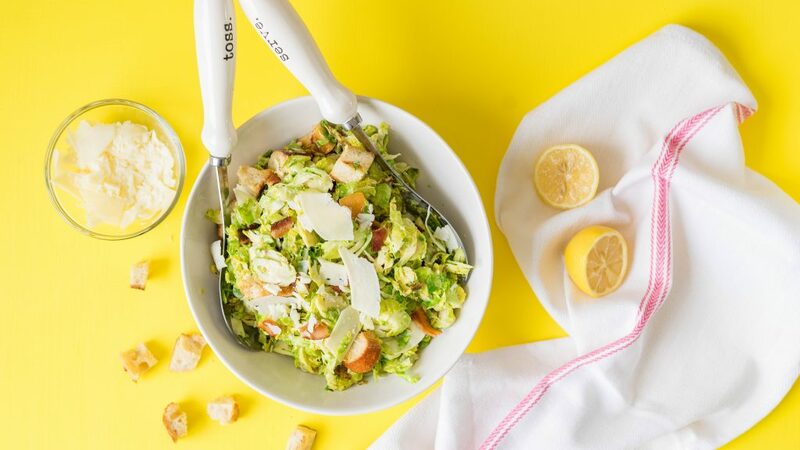 I had this Warm Brussels Sprouts Caesar Salad a few months ago, opting out of their excellent sandwiches and pizza, and it was the best decision I’ve ever made. I didn’t know what glory I was in for. 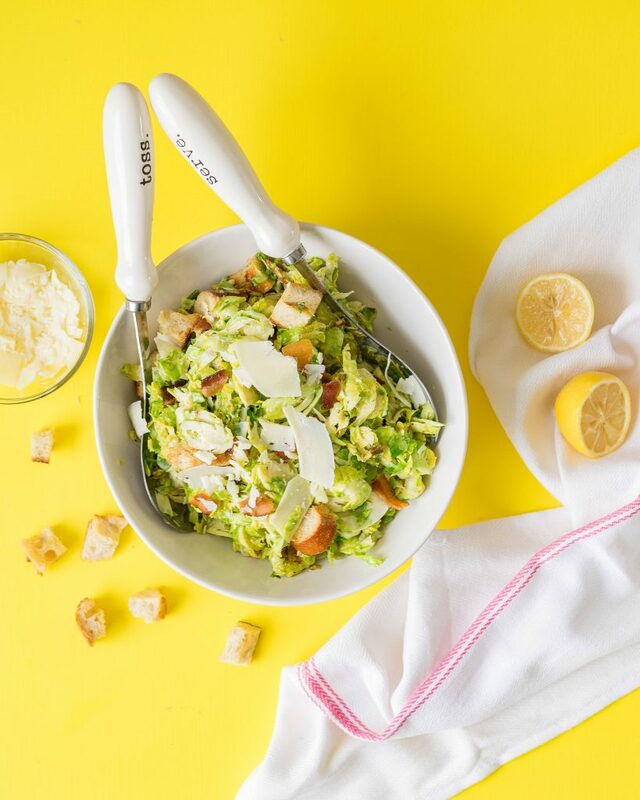 The brussels sprouts were sauteed until softer but maintaining good, crunchy texture, tossed with bacon, a lemony caesar dressing, and huge, buttery croutons. Everything a girl could want. With the sauteeing and DIY dressing, it does take a little longer to toss together than your average salad, but if you want to use storebought dressing, I’ll look the other way. Just do me a favor and add an extra squeeze of lemon – the citrus really makes the salad. The same goes for the croutons, but at least do the croutons from the store bakery. Way. Better. This Warm Brussels Sprouts Caesar Salad can easily work as your whole meal, or serve it along side something else if you want. Might I recommend Sous Vide Tri Tip? My favorite part: it’s healthy-ish while still being delicious. We have to slowly glide into those New Year’s Resolutions. On a baking sheet, toss cubed bread with butter and salt. Bake in preheated oven for 15-20 minutes, or until crunchy all the way through and browning on the outside. To make the dressing, add all ingredients to a food processor and pulse until smooth. Begin heating a large nonstick skillet over medium heat. Add the olive oil, then the brussels sprouts and salt. Toss to coat and reduce heat to medium low. Saute until softened, but still crunchy, about 10 minutes. Add brussels sprouts to a large salad bowl. Pour desired amount of dressing onto the brussels - you'll have some dressing leftover. Squeeze the half of lemon over the brussels. Break bacon into pieces and add to the salad bowl. Toss to coat. Top salad with croutons and shaved parmesan. Serve. 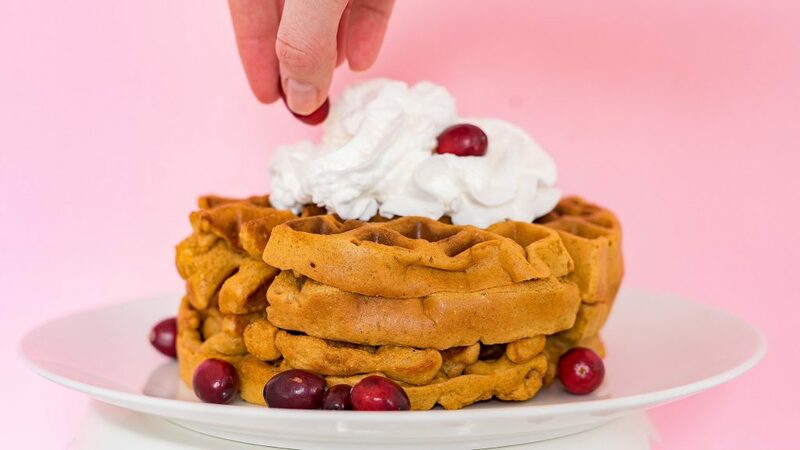 You guys love my recipe for Easy Pumpkin Waffles. Like love it. Every year come fall, it instantly becomes the most popular recipe on my blog. And I don’t blame you! It’s a great recipe, and so fun to make this time of year. 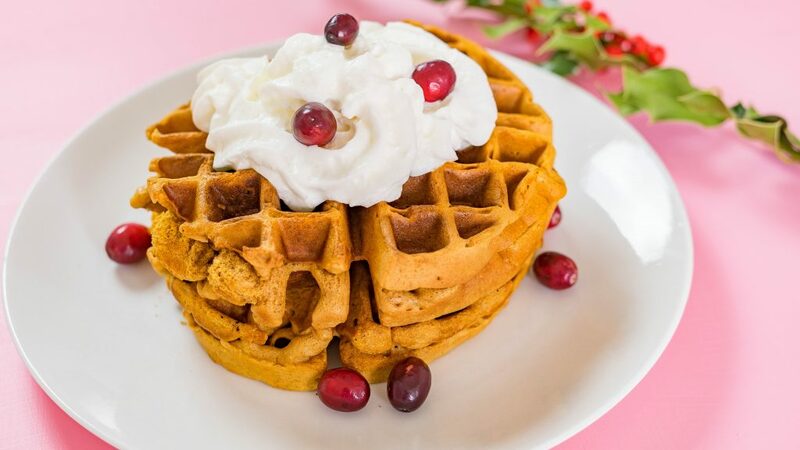 But fall flavors can’t have all the fun: so I whipped up this recipe for Easy Gingerbread Waffles to let winter in on the action! If you follow me on Instagram, you know there was a debate as to whether these should be Easy Gingerbread Waffles or Easy Gingerbread Pancakes. Technically, pancakes won… but pancakes are boring. Friends, I’m sorry! If you really want to make pancakes, make this batter and then… make pancakes with it. It’s that easy. These Easy Gingerbread Waffles use your favorite waffle mix + a few household ingredients, like molasses and brown sugar. I love to top mine with plenty of whipped cream and cranberries make for a pretty gorgeous garnish. Pro tip when making these waffles: try not to over mix the batter. Easier said than done, since you also don’t lumps, but it’ll help you avoid a “gluey” texture. Happy holidays, and enjoy this recipe every Saturday through Christmas – because when else can you gorge yourself on gingerbread? Whisk together the mix and pumpkin pie spice. Add molasses, brown sugar, vanilla, and canola oil. Add water at about a quarter cup at a time and mix until batter is lumpy and thick. Don’t over mix. Spray waffle iron with cooking spray and use according to manufacture instructions. 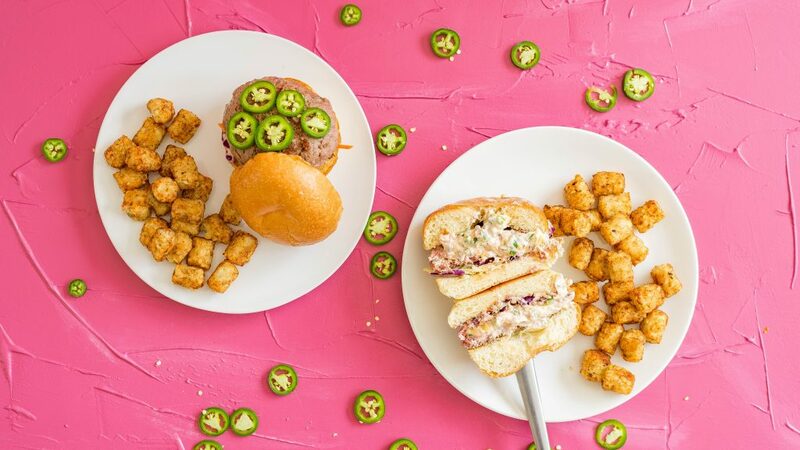 This recipe for Jalapeno Popper Stuffed Sous Vide Burgers is from my brand new book, Everyday Sous Vide: It’s All French to Me. Snag the book for lots of amazing sous vide recipes like this one! Stuffed burgers are the most fun recipes I’ve ever written. I love burgers. All the burgers. Don’t we all? But, do you know what makes a burger the best it can be? Stuffing all those toppings inside sous vide burgers. Or at least the cheese. That’s the important part. These burgers are messy, ooey-gooey, and all things right in this world. They come stuffed with enough flavor that I don’t think condiments are necessary, but you can add them if you want. The key is a high quality bun, slathered with butter and lightly toasted. Please and thank you. I credit my love of jalapeno poppers to my parents, as these are an appetizer go-to at any party they host. They are the perfect combination of creamy, salty, and spicy, and they are shockingly addictive. So why not take all of those ingredients, and put them inside a burger? It’s an obvious move, and I’m disappointed in myself because it took 27 years for the idea to occur to me. For this recipe, you’ll use the water displacement method to get the air out of your bag so you don’t damage the burgers. Here’s how you do it: add all the ingredients to the bag according to the recipe’s instructions. Zip the top of the bag until it’s almost closed, but leave a little crack. Submerge the bag, starting from the bottom, in a large container of water (I recommend just using your water bath before you start heating it), until the water has just reached the zipper – do not submerge the zipper. Direct the air towards the crack in the zipper, then zip closed. Most of the air should be removed. Get immersion circulator setup and start preheating water bath to 130 degrees F.
In a large bowl, add the ground beef, salt, and pepper. Mix with your hands until salt and pepper are evenly distributed. Divide the meat into 8 equal sized balls. Press flat into relatively thin circles, just shy of ½ inch. Spoon a quarter of the cream cheese mixture onto each of four of the patties, leaving about ¾ of an inch around the edge free of cream cheese. Place a patty that hasn’t been topped with the cream cheese mixture over the top of one that has. Pinch the edges together and reshape to seal in the cream cheese mixture. Repeat with remaining patties. Add to bag and remove the air using the water displacement method. Add the bag to the water bath and cook for 45 minutes to 2 ½ hours. Preheat a cast iron skillet over high heat. Remove burgers from water bath and bag. Sear in hot skillet on both sides until browned. Let rest for 5 minutes. Serve on a bun with your favorite toppings. This recipe is a version of Sous Vide Cheesecake from my brand new book, Everyday Sous Vide: It’s All French to Me. Snag the book for lots of amazing sous vide recipes like this one! Sous vide desserts are perfect for the holidays. Per. Fect. Why, you ask? No matter how annoyingly difficult the traditional recipes for a dessert are, the sous vide versions are easier. Blend the ingredients. Pour them in a jar. Drop the jars in a water bath. Chill. That’s it. And they’re great for entertaining because you create them in individual portions. No slicing and serving and getting everyone’s portion size just so. Hand ’em a jar. Let them eat cake. Sous vide cheesecake, specifically. 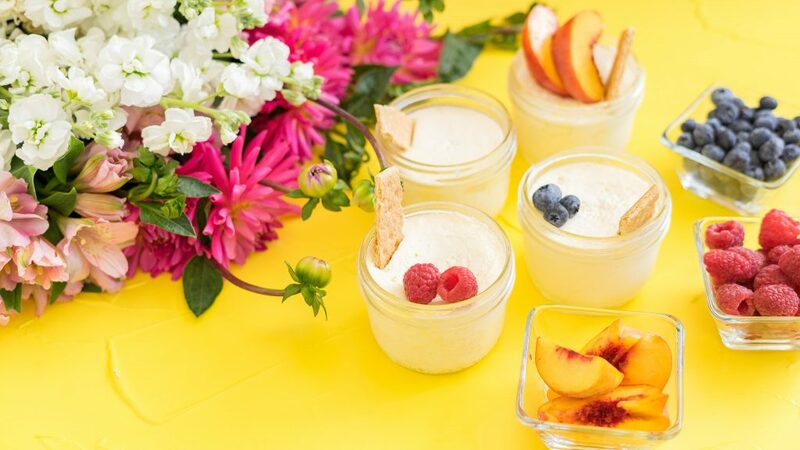 Because cheesecake is always a crowd pleaser! My recipe in the book is really simple and meant to be a foil for whatever flavors you’d like to add. For this variation, I sub out the vanilla for Nielsen Massey’s new Pure Lemon Paste. It’s made with pure lemon extract and contains the natural essence of California lemons. I love the way this new addition serves as a time-saver in the kitchen, allowing you add a layer of sweet, bright, citrus flavor to many dishes, without the need to juice or zest. Not to mention, it smells really good. Get immersion circulator setup and start preheating water bath to 175 degrees F. This is a hot temperature for sous vide cooking: don’t forget to place a trivet under your container! Add all ingredients to a blender. Blend until smooth - there should be no cream cheese chunks and eggs should be completely incorporated. You may need to pause the blender and use a spatula to scrape down the sides a few times. 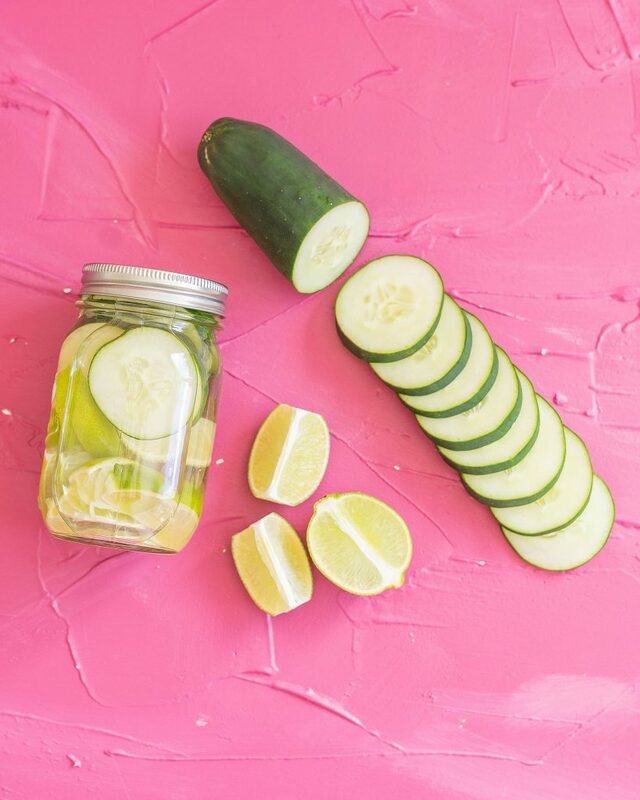 Prepare 6 quart-sized, wide mouth mason jars by removing the lids and spraying inside of jars with nonstick spray. Pour the cream cheese mixture evenly between the jars. Place the undamaged lids on your jars. Close to "finger tight" (you should be able to easily unscrew with just your fingertips). Drop jars carefully into water. Jars should be completely submerged and you should see small air bubbles escaping the jars. If the jars are floating, your lid is on too tight. Let cook for 1.5 hours. Remove mason jars to a towel on the counter to cool. Once cool to the touch, place in the refrigerator to chill overnight. Serve with fruit, jam, or crumbled graham crackers if desired.